Motivated by the limited response to immunotherapy among prostate cancer patients, Jachetti et al. explored the potential immunosuppressive role of mast cells in a paper recently published in Cancer Immunology Research. Mast cells are innate immune cells that promote angiogenesis and tumorigenesis, and they are known to promote the development of adenocarcinoma in the prostate. For this study, the researchers chose the transgenic adenocarcinoma of the mouse prostate (TRAMP) mouse model, which resembles human pathology. In TRAMP mice, progression of prostate cancer is driven by the transgenic expression of the oncogenic SV40 Large T antigen (Tag); because Tag in this system is a self-antigen, mice are peripherally tolerant despite tumor growth. Jachetti et al. first crossed TRAMP mice with mast cell-deficient KitWsh mice to determine whether mast cell deficiency would lead to reduced adenocarcinoma formation. They found that the KitWsh-TRAMP mice had significantly reduced adenocarcinoma growth compared with TRAMP mice. (Interestingly, the incidence of prostate neuroendocrine tumors increased. This suggests that mast cells promoted adenocarcinoma growth, but reduced the growth of aggressive neuroendocrine tumors. Mice with neuroendocrine tumors were not analyzed further in this study.) In addition, the team confirmed that CD8+ T cells were tolerant of the Tag epitope in TRAMP mice, but mounted a cytotoxic response to the same epitope in KitWsh-TRAMP mice both peripherally and within the tumor microenvironment, suggesting that mast cells play a role in CD8+ T cell inhibition. To confirm these results, the researchers added bone marrow-derived mast cells (BMMCs) to KitWsh-TRAMP mice. The addition of BMMCs reduced CD8+ T cell activity to the levels found in TRAMP mice and significantly increased the incidence of adenocarcinoma. The link between T cell function and tumor growth was confirmed by T cell depletion experiments. Overall, these experiments demonstrate that mast cells inhibit CD8+ T cell activity and promote adenocarcinoma growth in TRAMP mice. The researchers set out to understand the mechanism behind mast cell influence on CD8+ T cell activity. They demonstrated that mast cells did not affect the overall CD8+ T cell frequency in the spleen or CD8+ and CD4+ T cell infiltration into the prostate, ruling out non-specific T cell expansion. In fact, mast cells did not directly interact with CD8+ T cells in the spleen at all. Instead, the researchers found that mast cells colocalized with polymorphonuclear myeloid-derived suppressor cells (PMN-MDSCs) in the spleen, where they communicated via CD40/CD40L binding. Ligation of CD40 on PMN-MDSCs triggered upregulation of Arg1, iNOS, and STAT3, which enhanced suppressive function. Thus, mast cells interact with PMN-MDSCs via CD40 to suppress CD8+ T cells, leading to cancer immune escape and adenocarcinoma development. Hinting at an additional level of complexity in the system, Jachetti et al. posited that additional, as yet unidentified, mechanisms involving mast cells and CD40L signaling may be involved in adenocarcinoma growth. With clinical relevance in mind, the researchers analyzed human prostate cancer samples and found colocalization of mast cells and myeloid cells. Gene expression analysis indicated that high expression of mast cell/PMN-MDSC gene signatures correlated with biochemical relapse and reduced survival in prostate cancer patients. Overall, the results of this study suggest that CD40/CD40L signaling may be involved in immunosuppression in human prostate cancer, and the potential for enhancing immunosuppression may need to be addressed in future immunotherapy treatment designs utilizing CD40 agonism. Jachetti E., Cancila V., Rigoni A., Bongiovanni L., Cappetti B., Belmonte B., Enriquez C., Casalini P., Ostano P., Frossi B., Sangaletti S., Chiodoni C., Chiorino G., Pucillo C.E., Tripodo C., Colombo M.P. 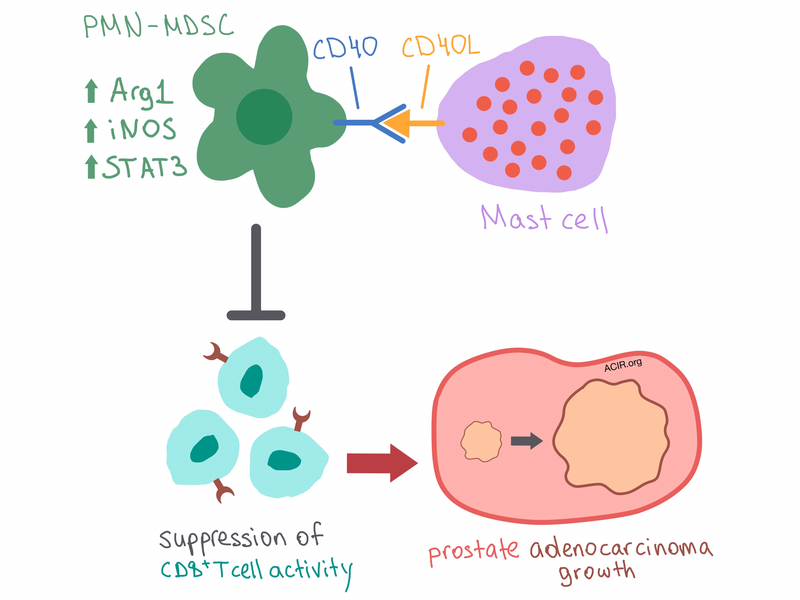 Cross-Talk between Myeloid-Derived Suppressor Cells and Mast Cells Mediates Tumor-Specific Immunosuppression in Prostate Cancer. Cancer Immunol Res. 2018 Mar 9. Intravital imaging of recently activated naive T cells by Bohineust et al. has revealed that following a period of reduced motility and dendritic cell (DC) interaction lasting 3 to 30 hours, T cells dissociate from DCs and divide as motile, unassociated cells. Intrinsic changes in store-operated calcium entry in the newly activated T cells prevented further motility arrest by DCs. Forced TCR signaling in newly activated cells blocked mitosis, suggesting that the early phase of newly stimulated cells disfavors additional TCR signaling and favors clonal expansion. Using models of malignant mesothelioma in immunocompetent mice, Li et al. found that AMD3100 (a CXCR4 antagonist) enhances the antitumor efficacy of the fusion protein vaccine VIC-008 and improves survival. VIC-008 augmented tumor antigen-specific CD8+ T cell responses and facilitated tumor infiltration by lymphocytes, but was associated with increased PD-1 expression. AMD3100 reduced PD-1 expression in CD8+ T cells, reduced tumor infiltration by Tregs, and converted Tregs into helper-like cells. Yu et al. screened nine anti-CD40 monoclonal antibodies (mAbs), and found that the mAbs that bind the part of CD40 farthest away from the cell membrane do not compete with CD40L ligation and act as agonists, while those binding closer to the membrane interfere with CD40L binding and act as antagonists. For most, but not all, mAbs, agonism also depended on affinity for FcγRIIB, accessibility of mAb Fc (based on epitope location), and local levels of FcγRIIB expression. Many human tumors express MICA and MICB proteins as a result of cellular stress, which can activate NKG2D receptors on NK cells, marking tumor cells for elimination. Tumors often evade destruction by proteolytic shedding of MICA and MICB. Ferrari de Andrade et al. developed monoclonal antibodies that prevented tumor cells from shedding MICA and MICB, restoring NK cell-mediated antitumor immunity in immunocompetent and humanized mouse models, via both activation of NKG2D receptor by cell surface MICA and MICB, and activation of Fc receptors by the antibody itself.